Today I left the house without tights and only wearing a trench coat. Yes you read that right. WITHOUT a woollen coat OR, TIGHTS. Today finally felt how a spring day should and I was able to wear my new striped skirt at long, long last. Mainly due to the fact that I've found that a great skirt really offers a happy medium to your wardrobe. 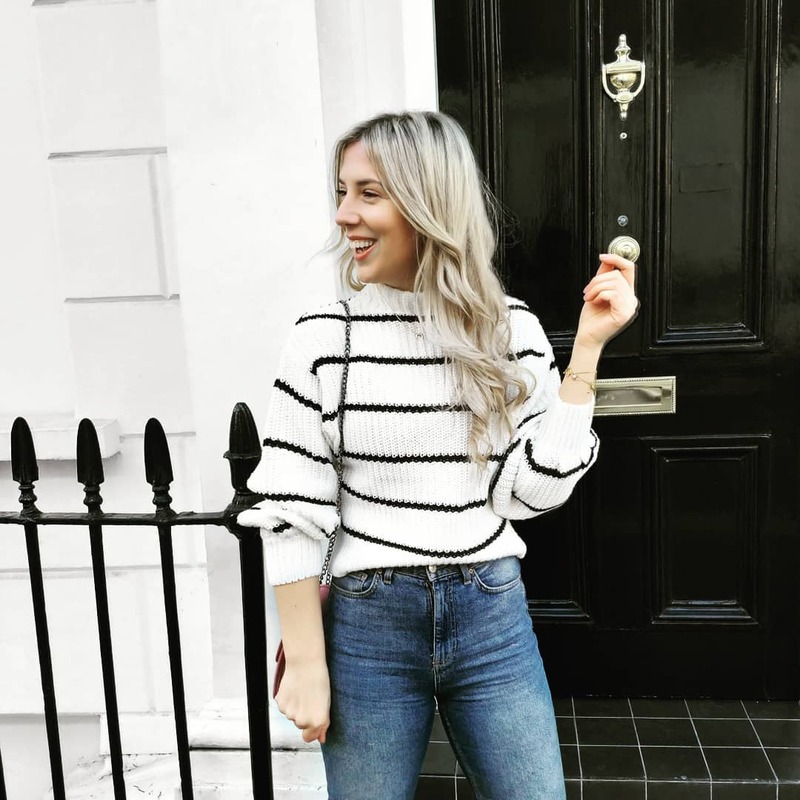 It's versatile, and will look as good worn with a jumper and ankle boots now as it will with a tee or a shirt when it eventually warms up. I fell in love with this style months ago and shot it very recently within an editorial I styled for LOOK magazine so when it became available in store I quickly purchased it. 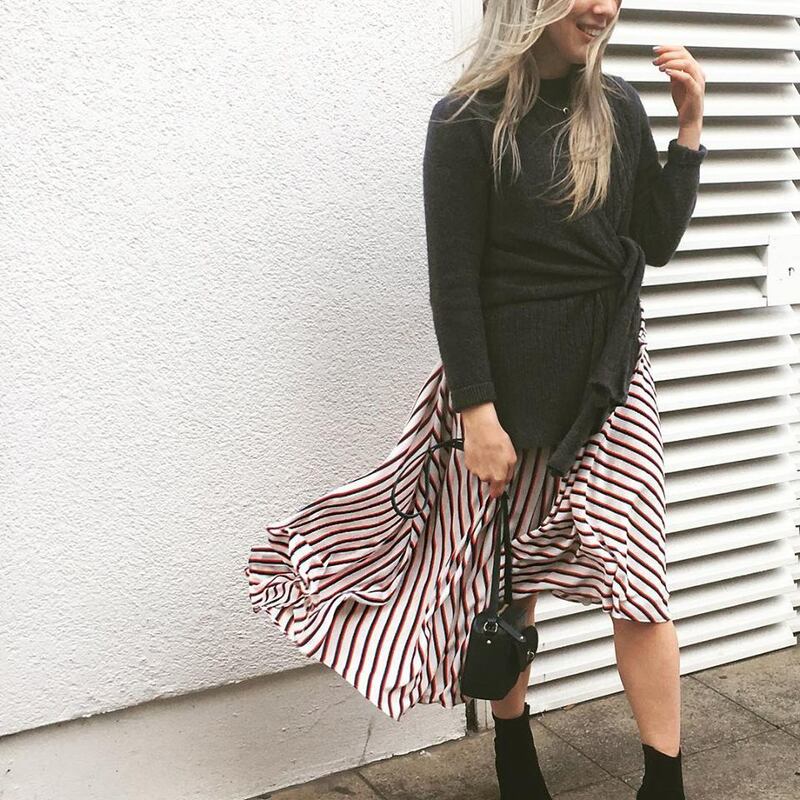 I loved the asymmetric style combined with the bold red, white and blue striped and knew it'd work oh-so well with everything in my current wardrobe. It's the type of skirt that makes you shamelessly beg your poor colleagues to photograph you awkwardly in over your lunch break. The skirt that you've already decided that you can rely upon for all summer events that crop up at the last minute and leave you stressed and stuck on what to wear. It's gonna be this skirt.every.single.time. It's from Studio by Preen at Debenhams which is my all time favourite high street/designer collaboration and season after season remains my favourite collection. I'm also reallllly into this button-front black skirt, also by Studio by Preen which I've had patiently waiting in my basket, saved until payday. Skirts had, up to about three years ago, always been my thing. If I wasn't wearing a dress I'd be wearing a skirt. I was super feminine in my styling and through my absolute hatred of my legs (not having 'the gap' seriously bothered me for quite a few years and I tried my best to fake having slim legs under skirts and dresses so noone would ever know whether my thighs touched or not. This was of course a very silly way to live and when I eventually moved onto another insecurity jeans and trousers became an everyday fixture in my life and wardrobe. My love of jeans and trousers over the last few months has considerably grown out of hand and I've completely ran out of storage. So, I've of course started to delve back into skirts and dresses and re-start my little collection.